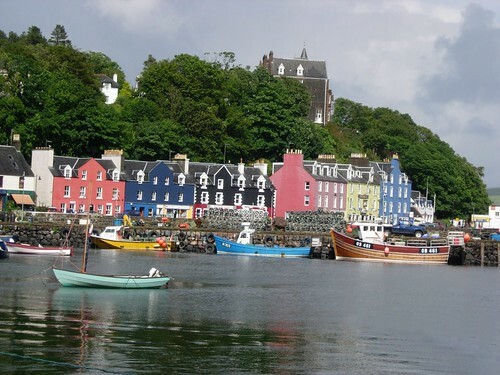 Tobermory is a small fishing port town on the Isle of Mull in the Scottish Inner Hebrides with a current population about 700. Till about a decade ago it was relatively unknown to the World. 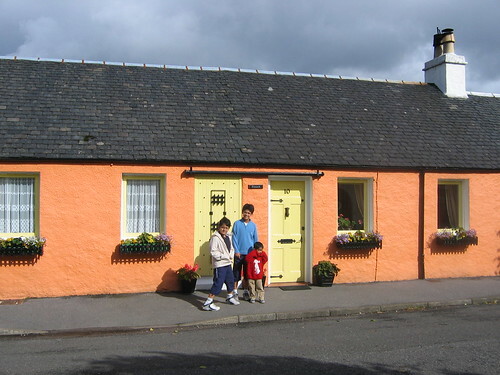 Many of the buildings on the main sea front are painted in different bright colours and British Television decided to use the coloured houses here as a backdrop for their TV serial for small kids entitled "What's the Story in Balamory", whose episodes revolved around an imaginary fictional small island community known as Balamory in Scotland. 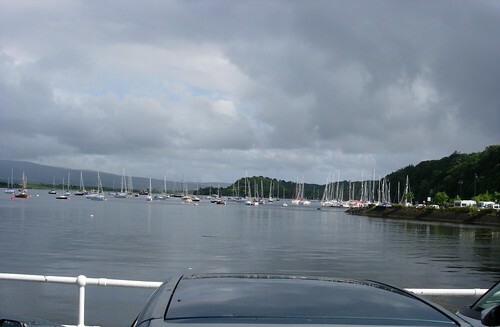 It was produced between 1999 and 2005 by BBC Scotland, with 254 episodes and soon became famous not only in the British Isles but also in other parts of the World. In the story, each main character has his/her own house/shop/workplace of a distinctive colour and they wear the clothes of same colour as their house. 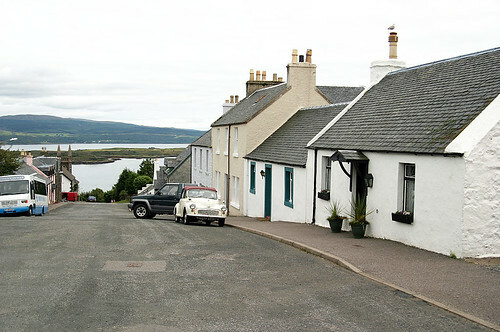 These buildings, which in reality exist in Tobermory*, are filmed from outside only and all inside shootings are in the studio or elsewhere. 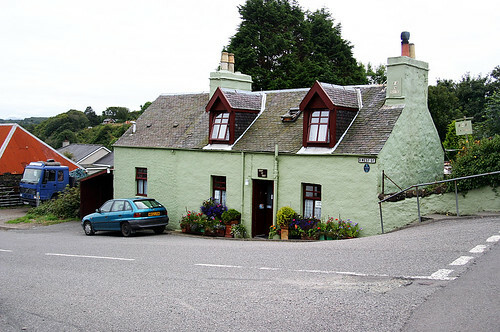 *Addendum - Feb 18, 2010: There is one exception - the Archie's pink coloured castle is in East Lothian and not in Tobermory. Also with the stoppage of shooting the town has reverted to more practical colours for the regular repainting required by continual exposure to salt water. Thanks to the popularity of the TV serial amongst kids, the town now has a thriving tourist industry with many gift and curio shops relating to the items shown in the TV serial. Many families visit the Island with their kids and they have great fun roaming around town trying to identify the houses of various characters. For the kids it is like a story world coming true. 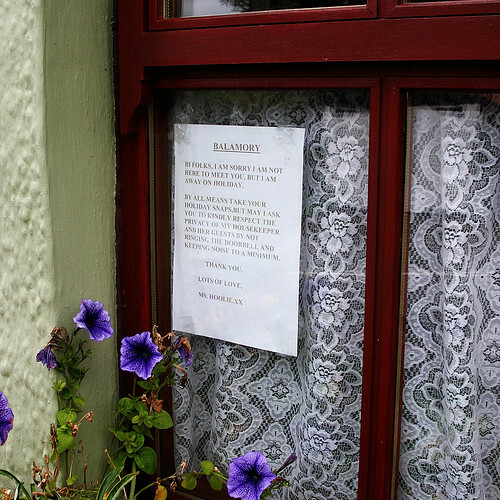 They even want to meet and see in person the fictional characters who are supposedly living the coloured houses. However this sometimes causes disturbance to the actual residents of the houses who have no connection with the characters in the TV serial. The three kids shown above are my grand children. I had a tough time explaining to the youngest one why we cannot go in and meet Spencer! Credits: I am thankful to Martin Burns for suggesting some correction and sending additional information, which I have included as addendum. Thank you Martin. 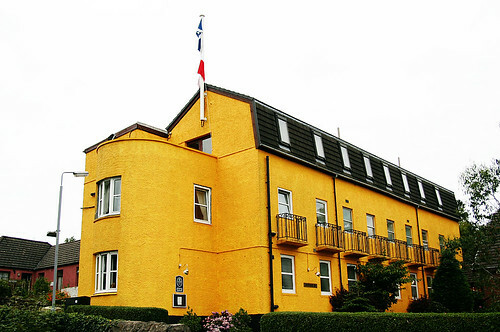 1) Not all the houses are in Tobermory: Archie's Castle is near North Berwick in East Lothian. 2) Since the show stopped filming, the town has reverted to more practical colours for the regular repainting required by continual exposure to salt water. Thank you Martin for the correction and update. I will include these in the main text also. Miss Hoolie's house is now dark blue! 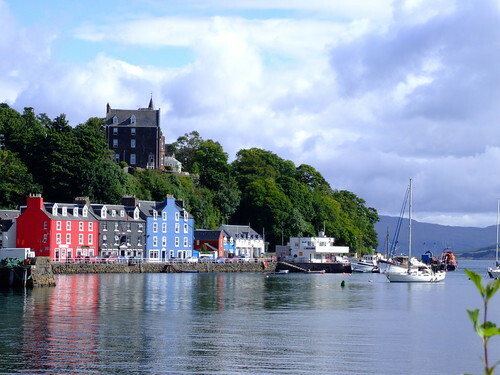 Spencer's is White... and Mrs McCreedy's is the Tobermory Chocolate Shop... just been for a visit!